Consortium stakeholders sign a memorandum of understanding. From left: JANM President/CEO Ann Burroughs, JANM board member Harvey Yamagata, Friends of Minidoka Chair Alan Momohara, Friends of Minidoka Executive Director Mia Russell, Heart Mountain Wyoming Foundation Chair Shirley Ann Higuchi, HMWF Vice Chair Doug Nelson, JACL Executive Director David Inoue. The Japanese American Confinement Site Consortium (JACSC), a group of organizations and individuals dedicated to preserving and sharing the Japanese American incarceration experience, met at the Japanese American National Museum (JANM) in Los Angeles on Feb. 18 to further define its structure and purpose. 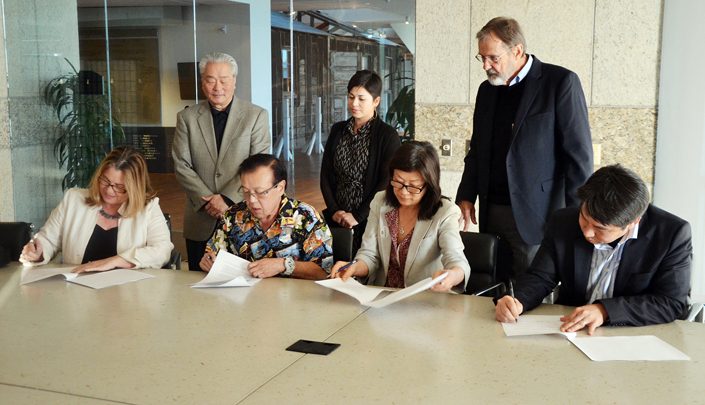 In a show of commitment and support for the consortium, four Japanese American organizations signed a memorandum of understanding (MOU) to provide the resources that will keep the consortium running. The JACSC began as a small group of stakeholders who met in 2015 to discuss the potential of a national body to help the various historic sites, museums, and preservation groups build capacity and reach wider audiences. While there has been great enthusiasm for the effort, building consensus and trust has taken time. The JACSC has progressed thanks to the funding of the Japanese American Confinement Sites program (JACS), which awarded the Heart Mountain Wyoming Foundation (HMWF) $60,599 in 2017 to serve as conveners for the JACSC. JANM hosted the February meeting, which ran for over eight hours as more than 40 people shared ideas, representing organizations such as the Amache Preservation Society II, Densho, Korematsu Institute, Manzanar National Historic Site, Friends of Minidoka, the Historical Museum at Fort Missoula, the National Japanese American Memorial Foundation, Poston Community Alliance, the Tuna Canyon Detention Station Coalition, and more. Over the course of the day, participants refined their vision of what the consortium could and should try to accomplish. “The consortium has the potential to channel tremendous energy and resources toward wide-ranging initiatives that illuminate the Japanese American experience and provide valuable social justice lessons,” said Brian Liesinger, coordinator of the consortium and author of the JACS proposal to fund the project. It was this potential to effect change that brought consortium members from around the country together last month —- not only to sort out the structure of the group, but to share their new campaigns and initiatives. One meeting alone will not create a sustainable vehicle for advancing shared interests, but after a day of talks, a solid framework for a support structure clearly received strong support from the participants. As part of a larger group, consortium members plan to use their strengthened numbers to lobby for their causes, raise money, and raise awareness. After the meeting, JANM, JACL, HMWF and Friends of Minidoka signed an MOU that expresses their shared enthusiasm, commitment, and responsibilities to the consortium and the logistics that go into running it. These four groups have pledged to provide significant resources, staff time, expertise, and convening space. JANM CEO Ann Burroughs has been vocal about her support of the consortium’s goals, and has graciously offered up the museum as a hub for meetings and events in the future. The JACL’s new executive director, David Inoue, plans to use the JACL’s experience in advocacy to organize visits to Capitol Hill to promote consortium members’ interests. The HMWF is a nonprofit whose board of directors is made up primarily of former incarcerees and their descendants, the foundation operates a successful museum at its former site in northwest Wyoming and welcomes opportunities to share its site preservation experience with other camps seeking to achieve similar goals. Friends of Minidoka was the most recent organization to sign on, and Chair Alan Momohara and Executive Director Mia Russell are poised to help lead an expansion of Minidoka’s exhibition and museum space. Other national groups are exploring adding their names to the MOU and accepting additional responsibilities, including financial support, to help the consortium run smoothly and assist less-resourced organizations to participate. For more information on the consortium, contact Brian Liesinger at brian@jacsc.org. *Note from Friends of Minidoka: the next Japanese American Confinement Sites Consortium will take place at JANM on Oct 20-21, 2018.